Deserts, in most parts of the world, are nomadic wastelands. Even if you can appreciate the beauty of endless sand and imposing red rocks, you typically won’t find much in those deserts aside from wandering tribes and the occasional outpost. But not in California. 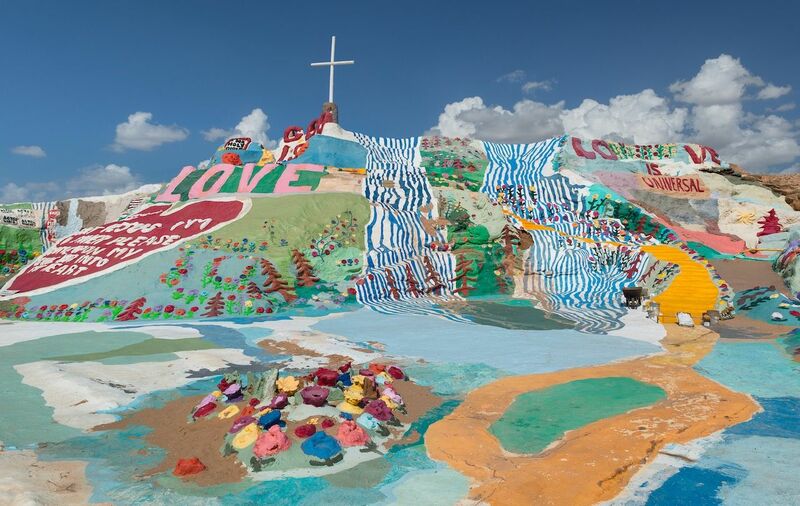 America’s home to the far-out and untraditional has filled its desert with art installations, deserted water parks, and Old West ghost towns that make a road trip through the desert as great a tourist attraction as Disneyland or Yosemite. Cruising the back highways of inland Southern California you’ll find all sorts of quirky little treasures. Here are 10 you must stop and see. The most impressive thing about this four-story, 35-room, 5,000-square-foot pueblo isn’t that it’s the meticulously preserved home of Cabot Yerxa, one of the men responsible for discovering the healing waters of Desert Hot Springs. It’s that the whole thing is made from stuff Yerxa found lying around the desert nearly 100 years ago. The structure is a hodgepodge of repurposed materials, from nails salvaged from abandoned cabins to scrap metal used to build walls. The interior is full of bizarre desert artifacts like coyote skulls and old food jars, and the floors on the ground level are natural desert dust. It’s a towering maze of desert conservation, one of the more surreal private home tours you’ll ever take. 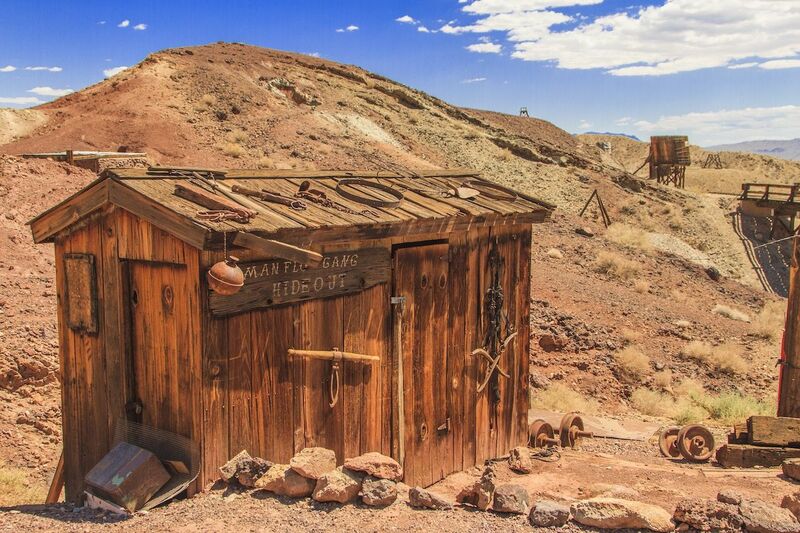 Though it’s hardly an unknown gem to anyone familiar with the Mojave Desert, Calico is probably the best-preserved, 19th-century ghost town in the region, and definitely the best setup for tourists. This one-time silver mining town died out when the price of silver dropped, and laid vacant until Walter Knott (of Knott’s Berry Farm fame) took it over in the 1950s. He donated it to San Bernardino County and it’s now a regional park, with a handful of shops and restaurants lining its wooden sidewalks. 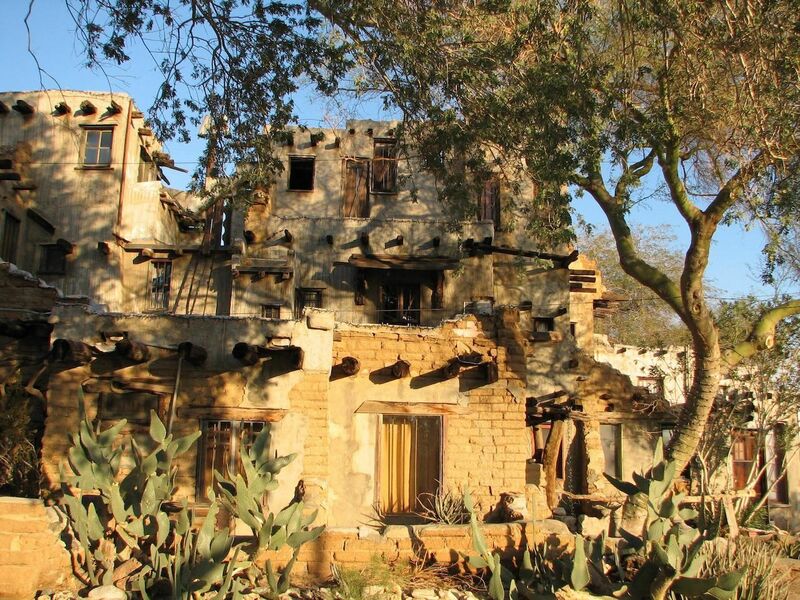 About a third of the original structures are still standing in Calico, where actors in period costumes roam the streets, and the occasional gunfight still breaks out in the streets. Anyone who’s spent a long weekend at Joshua Tree National Park has probably made a stop in tiny Pioneertown, with a population of 420. It might look like a classic old western ghost town, but this collection of wood saloons and feed stores only dates back to the 1940s, when Gene Autry and Roy Rogers built it as a permanent set for their movie westerns. Now it’s best known as the home of Pappy & Harriet’s Pioneertown Palace, a saloon, restaurant, and music venue where big-name acts play before gigs in LA or at Coachella. 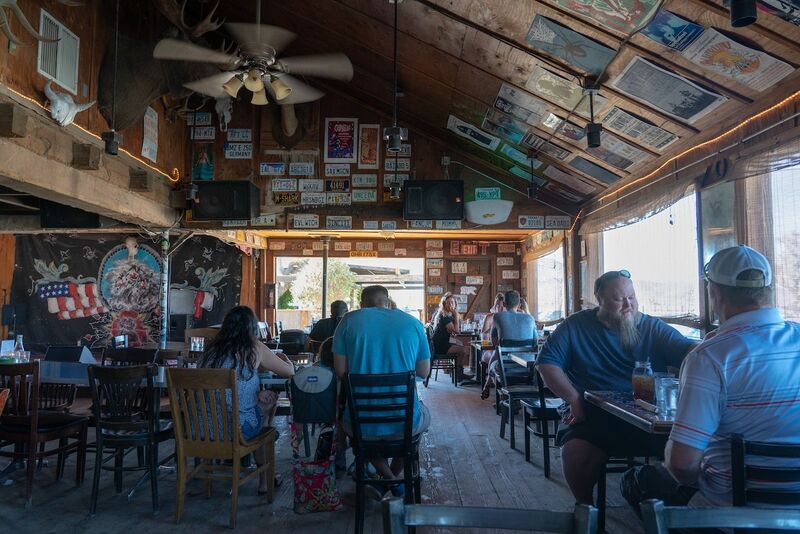 Even when stars aren’t taking the stage the remote bar is known as one of the best live music venues in America — and definitely the best in the desert. The middle of the Colorado Desert seems like an unusual place for a beach, but when the flooding Colorado River overtook a canal and flowed into this massive desert basin in 1905, it created the largest lake in California, the 360-square-mile Salton Sea. The lake then spurred a handful of little waterfront resort communities, which thrived until the lake began to die and the dead fish and birds gave it a famously-noxious odor. Now the desolate “resort” town is home to just under 300 people but has begun to attract artists, poets, and bohemians for its off-the-grid, apocalyptic beauty. Every year it hosts the inaccurately-named Bombay Beach Bienniale, where creative types inject the city with a few days of high culture in the forgotten desert. 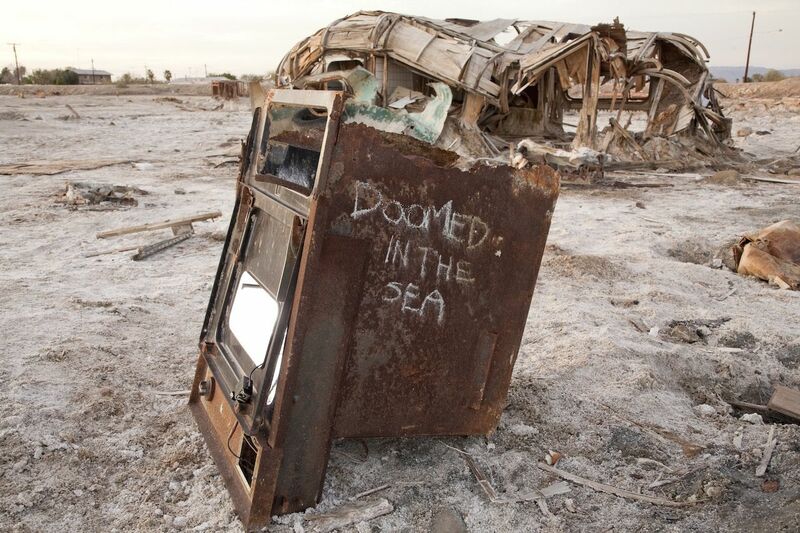 And if you happen to be in town during a showing at the Bombay Beach Drive-In, you’ll have the opportunity to watch a movie from an abandoned car on a screen made from the side of an old truck. Slab City is a community of people who’d rather avoid the outside world, a town with no electrical grid, its own waste system, no running water, and some of the coolest art in California. 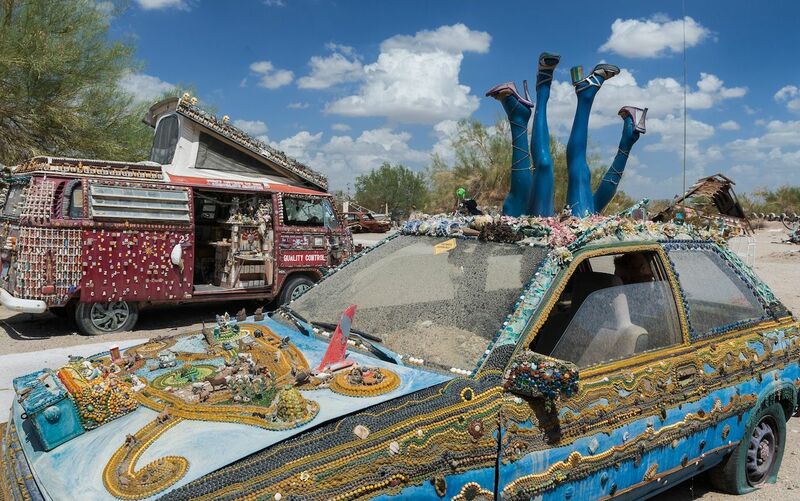 Though you’ll find decorated cars and trippy sculptures all over Slab City, the best concentration of artwork is in the East Jesus Art Monument. Here, colorfully-painted abandoned shacks sit in the sand next to a mammoth in a gas mask, rusted sundials, and a wall of televisions with commentary on our screen-obsessed culture. Once upon a time, this aquifer-fed oasis beckoned dusty travelers off the side of Interstate 15 between Los Angeles and Las Vegas to come and cool off on its slippery water slides. From the 1960s to the mid-1980s Lake Dolores was a roadside campground and water park where families could stop for a refreshing respite. It closed in the 1980s, then reopened as the 1950s-themed Rock-a-Hoola Water Park, then the Discovery Water Park in 2002. Discovery closed in 2004 and the park has sat as a relic for 15 years. Though it’s technically illegal to go stroll the grounds, it’s not exactly teeming with security, and the slides and lazy river have popped up in skating videos for years. 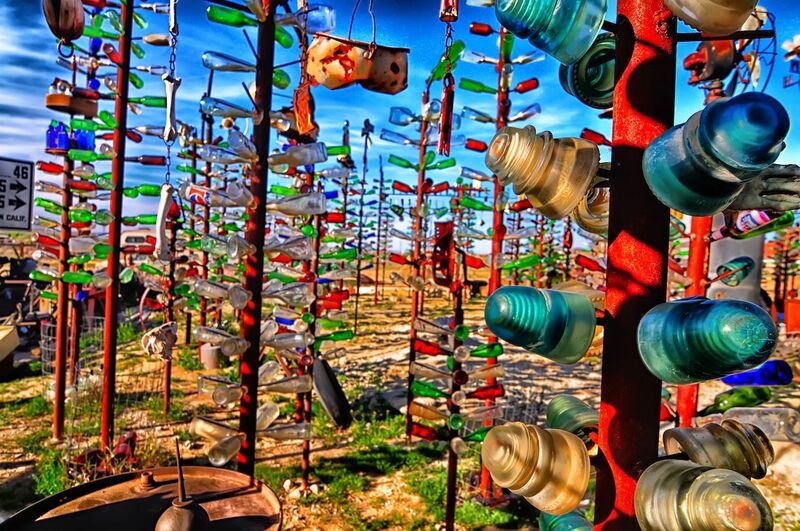 One of the state’s most renowned attractions off Route 66, this sprawling park of bottle trees has drawn people from all over the world for its unique, colorful installations. Elmer Long has been collecting bottles from the desert since he was a kid, and after amassing enough he developed this park, turning the bottles into painstaking pieces on metal trees, topped with everything from rakes to rifles to bird feeders. The ranch is a surreal forest of glass and desert refuse, where Elmer — every bit the California desert rat — happily strolls the trails and tells you stories about how he created each one. Admission is free, but donations are encouraged. Give a couple of dollars and you’re welcome to take a piece of glass home with you. Leonard Knight does not describe himself as an artist, but the giant adobe mountain he’s created about an hour and a half from Palm Springs in Imperial County would be hard to describe as anything but art. 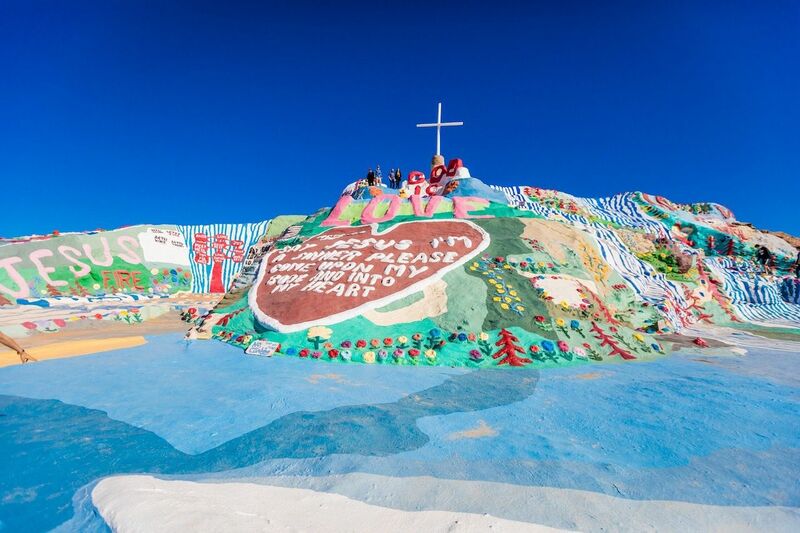 This giant tribute to God and his gifts to the world is an ever-evolving mound of painted clay, where Knight adds whatever sculptures inspire him, covers them in colorful paint, and lets the mountain grow at the side of a river bank. The one constant is the giant “God is Love” message atop the 50-foot summit, with the Sinner’s Prayer right below. No matter one’s thoughts on religion, this testament to God is an impressive work to observe. Artists truly are visionaries who see in everyday life what no one else can. 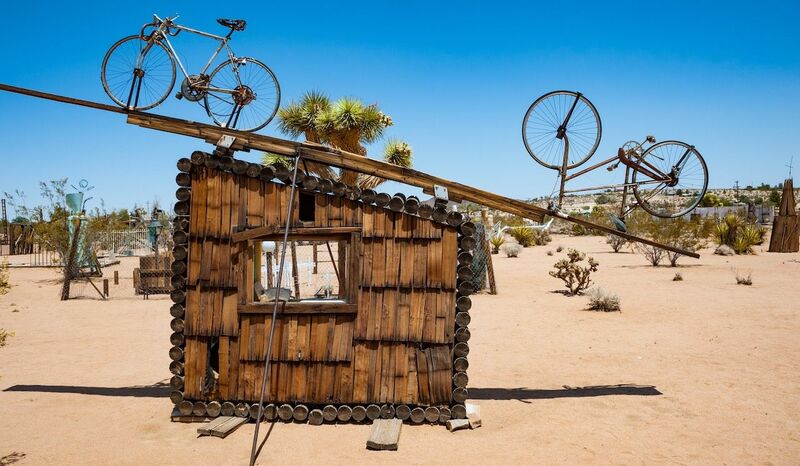 Look no further than sculptor Noah Purifoy’s sculpture garden near Joshua Tree National Park. The artist who made his name crafting sculptures out of debris from the 1965 Watts riots created an entire park of pieces made from desert “junk,” including televisions, tires, and old sinks. The museum is open every day from sunrise to sunset and is free to the public. 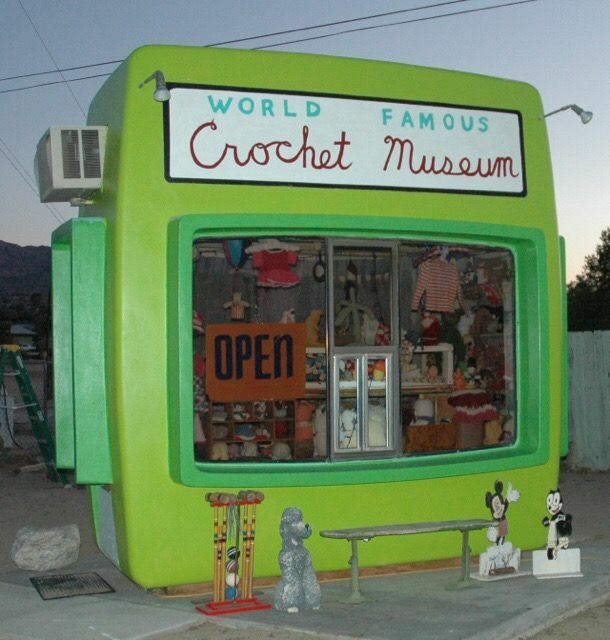 When this minuscule museum opened just down the street from the Joshua Tree Saloon it wasn’t actually “world famous.” But HSBC has done its part to help the little green trailer live up to its name, placing pictures of the museum in airport ads throughout the world. Though most air travelers probably have no idea where — or what — it is, the World Famous Crochet Museum is a little hut that’s open whenever it feels like it, filled with crocheted animals, smiley faces, and even Oreo cookies. If you’re creeped out by large numbers of stuffed animals in one place it may not be for you. But for lovers of the bizarre, it’s worth the 10-minute visit. ← Solo Female Travel in Mexico — Is it Safe?